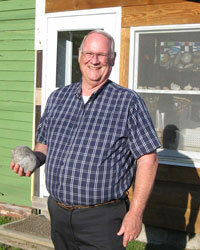 The cool windy weather has tested agate hunters during the past month. There have been a few good days, though, and a few great agates found locally. The first one to be featured this month is a different looking brecciated agate found by Larry Feist of Grand Rapids, MI. A breccia is a fragmental rock whose components are angular, which compares to a conglomerate that has water worn rounded pebbles. This brecciated rock seems to include fragments of amethyst and chrysoprase, as well as some banded sections. While attending the Moose Lake Agate Days show, I also was shown this very large brecciated agate. 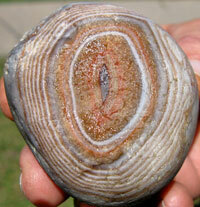 Notice how the matrix in which the fragments are cemented is completely different than the Feist agate. Just the other day this ¾ pounder was brought into the museum by Jeff Robbins. It has almost a perfect concentric banded face on top. 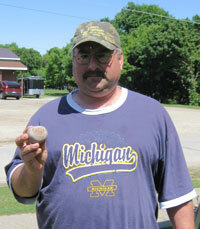 This treasure was found by Jeff Robbins from Lake City, MI. 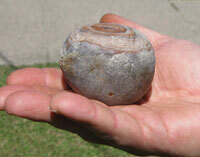 He found it on the beach near Muskallonge Lake, east of Grand Marais.